In regards to childhood and mysticism though I read an interesting quote in the "Universe Story" Briane Swimme. "Li Sao [China 4th c BC] gives expression to the deepest sorrow in a poem entitled 'Falling Into Trouble'. Mencius (??) tells of the tendency in humans as they move out of childhood to throw away their minds. Thereafter the whole life is to recover the lost mind of the child." This is explained as to how the Chinese (or at least ancient Chinese) saw what we term the "fall". I highly recommend reading Wilber on developmental spirituality, to avoid the trap of thinking that infants and children are more spiritually mature than adults, and that adults have fallen away from some pristine state of paradise. Especially Up From Eden and The Atman Project. The jist is: infants aren't in Paradise; they just don't yet realize they're on Earth. Subconsious Hell -> Conscious Hell -> (Super)Conscious Heaven. Undifferentiated Union -> Differentiated Split -> Integrated Union. I know this is way too cursory, but I have a train to catch. If you and Panta wish to continue the Process Philosophy/Theology discussion, I might pipe in now and again, but I've kinda run out of steam. I'm enjoying the conversation, but alas, do not feel I'm contributing much worth commenting on at this time. Same here. I'm in "observation mode" with this thread. I find myself agreeing sometimes, disagreeing sometimes, and questioning where all this agreement and disagreement is coming from or what it's actually worth. The thread has value to me, but so far it isn't changing my thoughts about anything related to the actual thread topic. Mostly what I'm learning here has to do with the difficulty in communicating when people come at a subject from so many varied backgrounds and points of view. FWIW my background is so completely different from that of most others here that I've abandoned the idea that it's possible to get onto the same page as many here, and I'm pretty certain that any attempt to express my own spiritual sense of things is likely to be grossly misunderstood. So it's probably best that I just listen for now. I highly recommend reading Wilber on developmental spirituality, to avoid the trap of thinking that infants and children are more spiritually mature than adults, and that adults have fallen away from some pristine state of paradise. Especially Up From Eden and The Atman Project. The jist is: infants aren't in Paradise; they just don't yet realize they're on Earth. I'm not sure I *believe* the quote from Swimme's book (or that he believes it for that matter) haven't gotten to that point in the book yet actually-- was paging thru. I know enough about child cognition to know that children are at an earlier cognitive state and are not able to think as adult's do. This allows a certain naivety and innocence that is appealing and wonderful, but we could never go back and I dont' think we'd want to. You hear a lot of artists talk this way. I'm sure creativity has a part in mystical thought. BTW, I would also NOT ever think of children as more *spiritually mature*, I think what we are talking about is more mystical experiences that are available regardless of age, intellect (even to the mentally retarded), etc. Absolutely, hence Wilber refers to both developmental lines and peak experiences. At the same time, and in an different way, a child's creativity certainly flows more freely before the advent of an extreme adolescent obsession with self-image. This isn't so much the "Great Fall," as it is a pitfall of the developmental process itself. Sadly, it's one that many never overcome. I thought it was well presented from a more orthodox theistic point of view and the discussion thereafter was to the point. Inadequate in terms of Christian panentheism. A better illustration would be God as a collective consciousness connecting individuals through a web of spiritual relationships. The Holy Spirit of the Trinity. So what you actually describe is not all-in-god. Unless you are claiming bricks have consciousness and we have spiritual relationships with bricks? Also the author was specifically speaking to a plain vanilla flavour of panentheism. But I have a spiritual relationship with you . I did not say this person was incorrect; only inadequate. He has a piece of the puzzle. God the Father and the Son and the Holy Spirit are always present as well. Bricks are a combination of the clay created by God being modified by mankind's free will to be a co-creation. Not unlike grain being co-created by mankind's free will into digestible bread, or rapidly spoiling grape juice being co-created by mankind's free will into wine. Dawkins is an atheist incorrectly reducing pantheism to a tautology. He even says pantheism and atheism are synonyms, which is ample evidence he does not know what he is talking about. The Gaia hypothesis is a true pantheism. We are but cells in the all encompassing, sentient deity of Gaia. Definite not synonymous with atheism. The author's take on panentheism is a bit off. The 'world is in God' but not God; there is immanence but there is also transcendence. There is no identify as in pantheism, there is a dialectic between these two realities. Classical theism tends to overemphasize the transcendence of God, pantheism the immanence - whereas panentheism attempts to do justice to both realities of God relating to creation. In addition, he seems to be taking a literalist view of creation (from nothing). Such an ontological difference also leads to problems with understanding incarnation, Jesus as God and man, natural vs. adopted son of god, theodicy, etc. OK panentheists can't quite let go of dualism. Fair enough. takes more than one to have love........there must be the other. and/or it takes two to tango. When you love you are one. When you tango you are one. And when you don't you are one. Actually, no: when you love there must first be another, and, if lucky, be it a friend, a lover or a child - there are two becoming more, maybe not one but what is shared, what is created - is more than if there were no love. As for the tango: feel free to take to the floor on your own, I would always go with another. It is both more fun and much less silly looking. Where the little film fails is that it reveres the unity of the One but that is a limited beauty. A field of one kind of flower has its beauty, but a field of many different flowers, create a Unity that is a higher Beauty. The unity of the One is not as dynamic, not as interesting, not as beautiful, not the accomplishment as the unity of the many. You do have a fixation on one - which is the loneliest number! 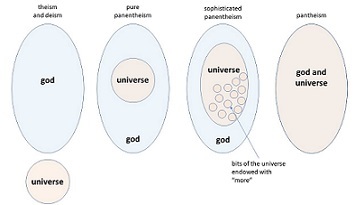 This is my take on panentheism as I see it. On the left and right we have the classic theism and pantheism respectively. The left middle is what the blog addressed. And the middle right is an approximation of thormas's take. Is this about right? Now, now you can't try to co-opt my expression. Oh, well - can't please everyone, but have no idea what your little picture means (looks like a rash). Is it from an official bubble site or is it an original Rom?